Believe it or not, this really happened on the show. We were pumped to check out a female-focused update of 1980s TV comedy The Greatest American Hero, but unfortunately, the reboot wasn’t picked up to series. However, the vintage version of the show is still packed with goofy delights well worth remembering—especially since we know just mentioning the title has stuck the preternaturally catchy theme song in your head (sorry not sorry). 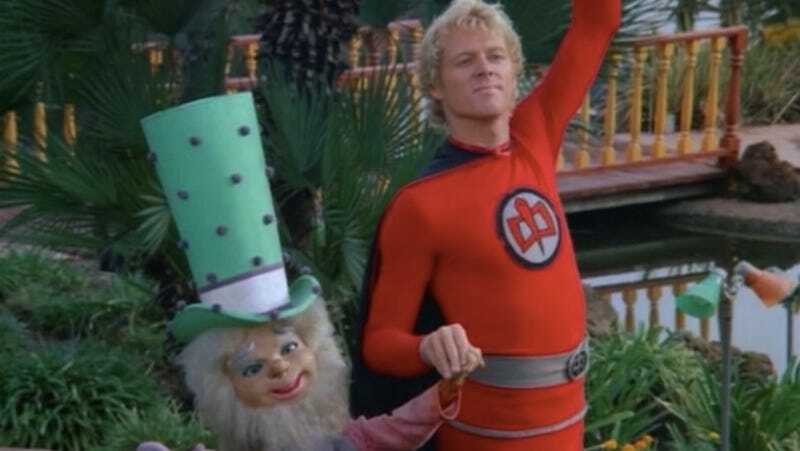 The Greatest American Hero ran for three seasons back in the early 1980s, chronicling the misadventures of a mild-mannered high-school teacher named Ralph Hinkley (William Katt) who’s given a skintight magical supersuit by aliens—but then promptly loses the instructions. Ralph attempts to use his newfound yet unknown abilities to promote justice with weekly assists from blustery FBI agent Bill Maxwell (William Culp) and classy attorney/love interest Pam Davidson (Connie Sellecca), Ralph’s missions escalated over the show’s run, from catching crooks and helping ordinary people solve their problems, to tangling with mad magicians, space creatures, and other kooky adversaries. (Though he got better at rolling with the punches, his flying skills never did improve.) The weirdest Greatest American Hero episodes are, of course, still the most fun to watch. Here are our favorites. The kids want to make it in showbiz, but they want to do it on their own terms, not “Pam has to date a sleazy producer” terms. Yep, that’s a voodoo doll. Unlike certain other FBI agents on TV, Bill is not a fan of aliens. Bill’s not Bill right now. “Holographing” for clues... it’s a superhero thing. Did we miss one of your favorites? There are a lot of gloriously weird episodes of this show packed into just three seasons. Share your picks below—and if you need to get inspired to revisit any of the episodes, you can watch all three seasons on Amazon.